HOUSTON -- At a towering 7-feet, 255 pounds, he is quite a presence on the basketball floor. And he proved that Saturday night at the Toyota Center where he scored 14 points and pulled down 10 rebounds to help his team tune out the Utah Jazz, 97-82. 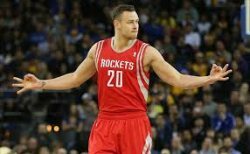 Meet Donatas Motiejunas, or simply D-Mo to his fans. The No.11 pick of the 2011 NBA draft, D-Mo plays both the center and power forward slots for the Houston Rockets, a Western Conference heavyweight whose frontline is bannered by the 6-foot-11 Dwight Howard. Though just 24 years young, D-Mo is quickly evolving as a significant piece of what the Rockets call the 'pursuit" of an NBA title that has eluded the franchise since 1995, when Hakeem "The Dream" Olajuwon was on the prowl and dominated both ends of the floor. In 38 games played this season, a stint that includes 28 starts while logging just over 27 minutes per, Motiejunas is averaging a robust 10.6 points, 5.9 rebounds and 3.4 assists a contest. It's an impressive feat given that D-Mo has scant NBA experience and is still learning the pace and style of the NBA game. Obviously, there is a lot of room for improvement. It remains to be seen whether D-Mo eventually blossoms into an All-Star or settles in only as a solid starter throughout his career. Either, this tower from Lituahnia is someone worth keeping tabs on as this 2014-15 NBA campaign plods along. Click here to view a list of other articles written by Leo Quilaton.